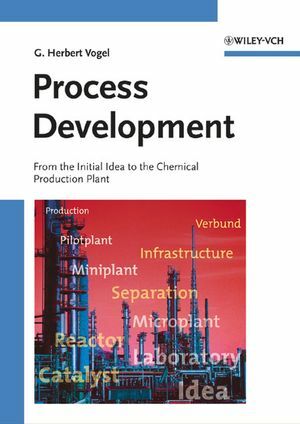 Guiding readers through all steps of the complex process, this book covers the most diverse aspects of chemicals production, including those not or insufficiently covered in natural science courses. These comprise economic feasibility, patenting and licensing, demands on the location and the problem of waste disposal. Throughout, the author does not rely on simple references to other literature but instead reiterates many facts and places them in context, as well as succinctly explaining formulas, thus removing the need to look up items in secondary reference works. As such, the book is suitable for both newcomers as well as those already working in the field. Those working in R&D as well as plant managers will learn how to avoid pitfalls, resulting in higher safety. A common basis and indispensable ready reference for engineers and chemists. Born in 1951 near Gross-Gerau, Germany, G. Herbert Vogel served an apprenticeship at Rohm & Haas before going on to study chemical engineering at Darmstadt Polytechnic and chemistry at Darmstadt Technical University, where he obtained his doctorate in 1982 in physical chemistry under Alarich Weiss. Between 1982 and 1993 he was employed at BASF AG in Ludwigshafen, working on the development, planning, construction and installation of petrochemical production plants. In 1993, he succeeded Fritz Fetting as Professor for Chemical Engineering at Darmstadt TU. His research interests are heterogeneous catalysis, chemistry under supercritical conditions and renewable primary products.